Do you have disability insurance? If so, have you reviewed what’s covered in your policy? If you don’t have disability insurance, do you know how important it is to your financial future? Disability insurance is one of the most overlooked pieces of coverage. Most Americans don’t have it, and they need it. 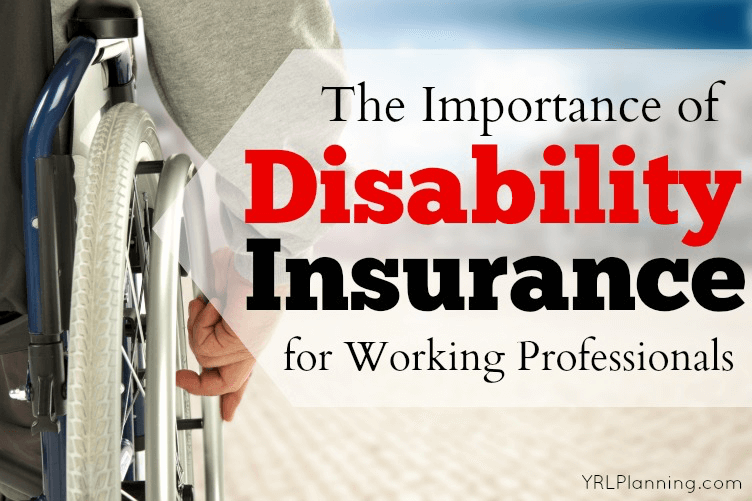 In this post, you will learn why disability insurance is so important for working professionals, which type of policy is most important, and three main ways you can find coverage. If you’re a more visual learner, jump to the bottom of this blog post to watch our video on why disability insurance is important for your financial future. According to the Council for Disability Awareness, just over one in four of today’s 20-year-olds will become disabled before they retire. Imagine being young and becoming disabled – unable to work the rest of your life. Could you pay the bills being absent from work? Imagine being a seasoned salesperson, having a stroke, and no longer being able to speak. Perhaps you’re a real estate agent . . . what would happen if you couldn’t show homes to your clients anymore due to debilitating back pain? Wouldn’t that be a nightmare? What would you do in these situations? Well, you could always dip into your emergency savings – if you have it. But what happens when you run out of that money and you still can’t work? What do you do then? Do you have a working spouse who makes enough money to cover your income loss? No? What then? That’s when disability insurance becomes vitally important. What types of disability policies are available? There are two main types of policies: short-term and long-term. Short-term policies offer coverage for six months or less while long-term policies offer coverage beyond six months. Many employers offer short-term disability policies as a benefit of employment. The problem is that these short-term policies, as the name implies, won’t cover you for a disability that sticks around for a long time. If you have a decent-sized emergency fund, you really shouldn’t need short-term disability insurance anyway. I recommend finding a long-term disability policy that aims to provide coverage up until retirement age. Some large employers offer such coverage, but it’s important to find out exactly what your policy offers – don’t assume you’re covered only to find out you’re not. How do long-term disability policies typically work? Okay, so you know to look for long-term disability insurance. How does it work and what benefits can you expect? Long-term disability insurance usually replaces up to about two-thirds of your income if you can no longer do your own job (or any job, depending on the policy terms). Premiums tend to run roughly 1 to 3 percent of your annual income, depending in part on the results of a medical exam that most people not getting coverage through an employer have to take. You can’t buy coverage to replace any more of your income, since insurers worry that there wouldn’t be enough incentive to try to get better. Translation? You still need emergency savings even when you have disability insurance – it won’t cover everything! Where can one find coverage? Employer-based disability insurance is usually limited in several ways, although many employers offer the opportunity to purchase further coverage at a discounted rate. Find out what your employer offers and discover more employee benefits while you’re at it! Private disability insurance is almost always more expensive than its employer-based counterpart, but unlike employer-based disability insurance, it may include better definitions of disability (ie it may pay if you can’t work at your actual job vs being able to work at any job), and you may be able to get a higher percentage of income covered. Spend a little time looking over your disability insurance options and don’t put off evaluating this very important piece of coverage – you never know when you might need it! If you would rather avoid have a commissioned insurance sales agent review your options, then consider having a non-commissioned (or fee-only) Certified Financial Planner review your benefits, along with your big-picture financial plan. Schedule a complimentary consultation with Your Richest Life and start your journey to financial wellness today!